Spinal Cord Injuries From Wisconsin Motorcycle Crashes | Hupy and Abraham, S.C. Most motorcycle accident victims do not suffer spinal cord injuries, but the damage and pain are significant for those who have suffered this type of injury. Since the consequences of spinal cord injuries can be paralysis or death, it is important for every motorcycle rider to understand the different types of spinal cord injuries that can result and what to do about them if they happen. Incomplete spinal cord injuries. riders who suffer incomplete spinal cord injuries retain some sensory or motor function below the part of the spine that was hurt. How much sensory or motor function is dependent on the type of injury that is suffered. Incomplete spinal cord injuries include anterior cord syndrome, central cord syndrome, posterior cord syndrome, Brown-Sequard syndrome, and cauda equina lesions. Complete spinal cord injuries. riders who suffer complete spinal cord injuries are often paralyzed below the point on the spine where the injury occurred. If the injury occurs at the T1 level of the spinal cord, then complete paraplegia may occur. This may allow the victim to retain use of the hands and arms even though the trunk, legs, and feet are paralyzed. When the injury occurs higher up on the spinal cord, such as in the cervical area, then complete tetraplegia may occur and the victim’s body below the neck may be paralyzed. Spinal stenosis. Trauma caused by a motorcycle accident can dislocate the spine or result in a fracture that puts pressure on the spinal nerves and results in significant pain in the lower back or legs. Weakness and numbness may also result, and victims may be unstable and susceptible to falls. 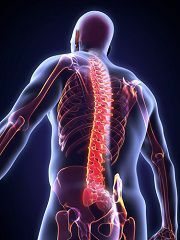 However, it is also worth keeping in mind that a serious spinal column injury can occur with no immediate symptoms at all. Only gradually, over a period of hours or days, may the injured person begin to feel numbness or paralysis as injured tissues bleed or swell. Thus, it is always important to get medical care after a motorcycle crash. Money can’t replace the quality of life that was lost at the motorcycle accident scene, but it can help pay for the significant medical expenses and make up for the wages lost after a serious spine injury. Our motorcycle accident lawyers are riders ourselves and we believe that people should be held accountable for their negligence. You will need to take the first step to hold the driver who hurt you accountable. If you want to preserve your legal rights and seek justice in your motorcycle collision case, then please call us today at (800) 800-5678. We will give you a free, no-obligation consultation on your case, and talk to you about protecting your rights and recovery.